However, our lives are at a different frequency. Therefore, all we can do is express the emotion and intention of your breath. We glow with your singing and wither with your tears. Do you know how much of your essence you release into the atmosphere with your every breath, your every thought, your every smile and every sorrow? As Elementals we are bound to express our creations in alignment with your breath. 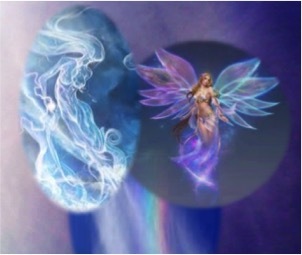 We Sylphs are vital to the life of all beings, as we bring oxygen to the mammals and light to the plants. Our plant friends are aware of our service and sway back and forth with the power of our movement. Our animal friends are aware of and acknowledge us. Humans have called us Faeries or bugs. Some have batted us away, and others, especially children, want to play with us. Many stories are written about us, which makes us quite glad. However, few humans are aware that we serve to clear Mother Gaia’s atmosphere and raise its frequency whenever possible. We love to do our work in the wilderness or where there are few humans, as the air over many of your cities is almost intolerable. We take turns working over these cities, as many of us have actually perished from your air pollution. There was a time when humans honored us and tried to keep their air clean, but then they withdrew much of their assistance. We wondered if it was our fault, or if the humans had gotten lost again in their greed. Our needs are simple. All we need is more love breathed into the air to assist us as we transmute the polluted skies. For a while, there was great disruption from a machine that pushed our ionosphere away and caused it to collapse. Our supervisors, the Devas, tell us that humans are stopping that activity. If this is so, we are very grateful. Many of our friends were lost due to that horrid machine. In fact, we Sylphs do not care much for any machines and wonder why humans can’t make them quiet and clean like the big Starships that fill our sky. The beings on the ships can see us and even communicate with us. The star beings on the Ships have told us to be patient a bit longer, as things are going to get better. Actually, many humans are trying to protect Gaia’s beautiful places, which will clear the sky and fill it with the harmonious thoughts of the plants and animals. Then we can get on with our plan to transmute Gaia’s atmosphere into its higher expression. Our favorite places are over oceans and forests. We can relax there because the water and the trees feed us with their life force. However, to be fair, we must say that more humans are looking into our sky with gratitude for its clarity and beauty. When we feel their appreciation, our energy is renewed to continue with our work. These humans are our friends. They know what we do for them, and help as much as possible. They may not be able to control much of the pollution, yet, but they can send us their unconditional love and violet fire, which is very much appreciated. Even though you humans do not see us, we can see you clearly. Also, we can instantly feel your intentions and know the humans with whom we can share our Silent Knowing. We have much Silent Knowing because we are everywhere and can feel information as it resonates throughout our skies. We absorb the many thoughts from all of Gaia’s life forms. Yes, all of Gaia’s beings have thoughts! Animals think. Birds think. Even plants think. It is just that most of the members of the animal kingdom, and all of the plant kingdom, think in a feeling, vibrational manner. In fact, non-humans think in vibrational patterns. Most humans cannot read these vibrational patterns, but we Sylphs can easily understand them. These thought patterns in our sky are how birds can migrate and animals can find water or each other. These patterns also influence the weather. Humans are unaware of how much they contribute to the vibrational patterns of the sky. However, many children can feel them. Unfortunately, the children forget this ability when they become adults. In many other “primitive” or “ancient” societies it was quite common to read these patterns to better navigate the land and sea, determine the weather, and gather information from the NOW of the ONE. If you will listen to the sky, you will learn a great deal. Also, if you call us, we will assist you in learning to read these energy patterns. However, with the chem-trails in the sky, no one can read them as they once did. We have tried to tell humans that these white streaks are not natural. In fact, they are laced with chemicals that are very hazardous for humans, plants, animals, and us, the Sylphs. Why would humans want to harm the sky? The humans who can talk to us say they are trying to stop this problem, but they do not have any more control over the “destructive ones” than we do. Fortunately, we can see that there are new patterns of a very high vibration entering the sky. We can see these patterns and love to rest within them because they are filled with love and joy. Our friends on the starships and our Deva supervisors tell us that more and more of these new frequencies of light are coming into our atmosphere. We are quite excited about this information. We are ready for a change. We don’t want to complain, but we are ready to pull our beingness into the higher sky. By higher sky we mean the sky that is of the new light. We have looked forward to this new light for millennia and eagerly welcome it. It appears that some humans can also see the new sky, and when they can see it, they can almost see us. We think it would be wonderful if humans could see us. However, some humans are very difficult for us to understand. On the other hand, there are other humans who are our best friends. They talk to us and listen to what we are saying. Do you think that there will be more of these kinds of humans soon? We really hope so, as we could use some help. The frightened humans are very messy and release the exhaust from their machines out into our sky to choke our plant friends and make the birds and other animals and insects sick. I would also be very helpful if you could assist us to clear the pesky chemtrails, and please remember that your EVERY thought and emotions comes into our sky for us to clear. Therefore, could you also remember to send us some Unconditional Love and Violet Fire? Do you think you could remember to do that for us? The word “slype” originated in 1650s, from Modern Latin sylphes (plural), coined by Paracelsus (1493-1541), originally referring to any race of spirits inhabiting the air, described as being mortal but lacking a soul. Paracelsus' word seems to be an arbitrary coinage, but perhaps it holds a suggestion of Latin sylva and Greek nymph. The meaning "slender, graceful girl" first recorded 1838, on the notion of "light, airy movements." Silphid (1670s) are the younger or smaller variety, from French sylphide (1670s). The exosphere is a thin, atmosphere-like volume surrounding a planetary body where molecules are gravitationally bound to that body, but where the density is too low for them to behave as a gas by colliding with each other. Earth's upper atmosphere, from about 60 km (37 mi) to 1,000 km (620 mi) altitude, and includes the thermosphere and parts of the mesosphere and exosphere. It is distinguished because it is ionized by solar radiation. It plays an important part in atmospheric electricity and forms the inner edge of the magnetosphere. In the mesosphere temperature decreases as the altitude increases and extends from about 20–50 miles (32–80 km) above the surface of the earth. The second major layer in temperature, with warmer layers higher up and cooler layers further down. This is in contrast to the troposphere near the Earth's surface, which is cooler higher up and warmer farther down. The troposphere is the lowest portion of Earth's atmosphere. It contains approximately 75% of the atmosphere's mass and 99% of its water vapor and aerosols. The average depth of the troposphere is approximately 17 km (11 mi) in the middle latitudes. The biosphere is the global sum of all ecosystems. It can also be termed as the zone of life on Earth, a closed system (apart from solar and cosmic radiator and heat from the interior of the Earth), and largely self-regulating. The hydrosphere in physical geography describes the combined mass of water found on, under, and over the surface of a planet. Via United Nations world inventory of water resources, it is estimated that there are 1386 million cubic kilometers of water on Earth. A lithosphere is the rigid, outermost shell of a terrestrial-type planet or natural satellite that is defined by its rigid mechanical properties. On Earth, it comprises the crust and the portion of the upper mantle that behaves elastically on time scales of thousands of years or greater. 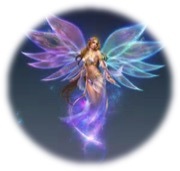 HOW DO YOU ASSIST THE SYLPHS? Thank you so for your wonderful comments. Can anyone comment on why the clouds seem to be getting lower? It seems like they are being pushed down and scattered. Is this the higher energies? Sorry I do not know about that and it does not seem to be occurring in my area. Dear Sue and the Sylphs, Briefly, I wrote to my local and federal gov rep's for an explanation of the streams coming from jets that we know as chem trails. I did not use that term, but asked for a breakdown of what was in those streams. The local rep replied with these words, "They are contrails. You are a conspiracy theorist and you probably believe there's a cure for cancer, too." The federal rep didn't bother to reply. Otherwise, I carry on and thank the Sylphs for protecting my garden area and pets and when I walk around my town I breathe in Light and breathe out Love in my attempt to clear the air. Here's some humour.... I've even gone so far as to stand in my post office and breathe similarly hoping my efforts will fill the post boxes with Love and Light and thus people will take it home and clear the air, too. I do see flashes of the Sylphs occasionally and I'm very grateful for that. Love, A. Yes, changes are indeed being made. Yes, Unconditional Love and Violet Fire!!!! When I look in the sky, I can see light reflecting off particles of dust. I have to focus my eyes to see it, but once I do these flowing lights reach up further then I can see. Little dusts of light everywhere. I wonder, do these specks of light follow me, and represent the reach of my Soul, or are they everywhere. Perhaps it is both. Perhaps it is the energy of the Souls of every being on the planet reaching up into the sky far beyond airplanes. It is a kind of sea for the Sylph's to swim in. Do the Fish notice the Water? We walk on the bottom on an ocean of Soul energy, and few humans can see the water all around them. I see these too! So cool! I am convinced I have been seeing the Slyphs. Small purple and sometimes white flashes of light appear for an instance. Tonight they presented as quick streaks of a whiteish color in the air. Also as a shadow that flew over my head. I looked expecting to see a nightbird but saw nothing. I have also seen them in the clouds. I wonder what they would have to say about hurricane patricia? Thank you Suzanne for the wonderful post. It all came back - forgiveness reverence and gratitude to the air elements came back. As we stand as pillars of heaven on earth, through our pre-sense , we are able to thank " Patricia in Mexico" for being strong and gentle at the same time. Thanks you. Thank you for this. I just did a deep meditation sending thanks and love and light to the slyphs. I think I have seen slyphs in daylight my whol life. Those little swirls of light moving in the sky, that move faster when the wind blows. Are those slyphs? The past months in a completely dark room, after a bit of meditation and relaxing my eyes, I see the room lit up by hundreds white lights. It is like looking up into the night sky filled with stars. So beautiful. Some are sort of still. Others flash brightly in and out of view. Sometimes there are red and cyan blue specks flying around too. These lights cause the air to slowly swirl. I can see the air as sort of a slowly moving swirling cloud of light green or sometimes magenta pink . I have been trying to figure out what these gorgeous lights in the dark are. I think they are sylphs. Maybe the blue and red specks are the water and the warmth in the air? Has anyone else seen such lights in the dark? Sophia Svarog a spritual seeker.